Not too many fixed gear ATB rigs hitting the FixedGearGallery these days. It's really hit or miss over there. I used to try and guess Which post is a mountain bike but in the case of manufacturers that are no longer producing ATB/MTB frames anymore, e.g. Bridgestone, I might miss something. So, now probably like everyone else, I just click on the next set of bikes to appear when Dennis updates the page. Speaking of frames no longer produced, there is a cool Bridgestone but labeled as a Diamonback. Marcello is using it as a winter commuter but plans to sell it and get another Bridgestone to build up. 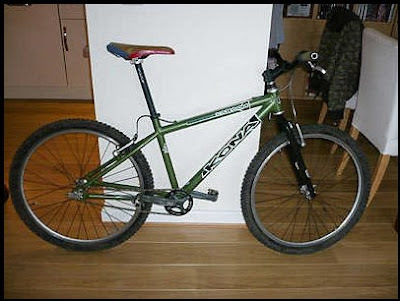 It's funny, when I did my original scouring of the FGG looking for ATBs I basically looked at all the known manufacturers that I knew that made mountain bikes, like Trek, Kona, Surly, etc... For some reason, I missed this one. I just love Konas. Not sure if I mentioned this site before but 63xc.com The Offroad Fixed Gear Site. The site author of the site said after 5 years and 20 issues it was time to move on to something else. Still the site is up and there is quite a bit of good reading there if want to know more about riding fixed gear off road. Speaking of Fixed MTB riding. I gave up on my Kona as a Fixed ride. It was just too much work in the woods and I was not enjoying it too much. My Kona Unit is now SS with 26 and 69 configs with a quick swap of the front wheel. That's too bad. I am planning on a fixed MTB ride next week at Huntington.